OK, let’s do that. Let’s allow attacking anybody who is wearing a political garment, why don’t we? 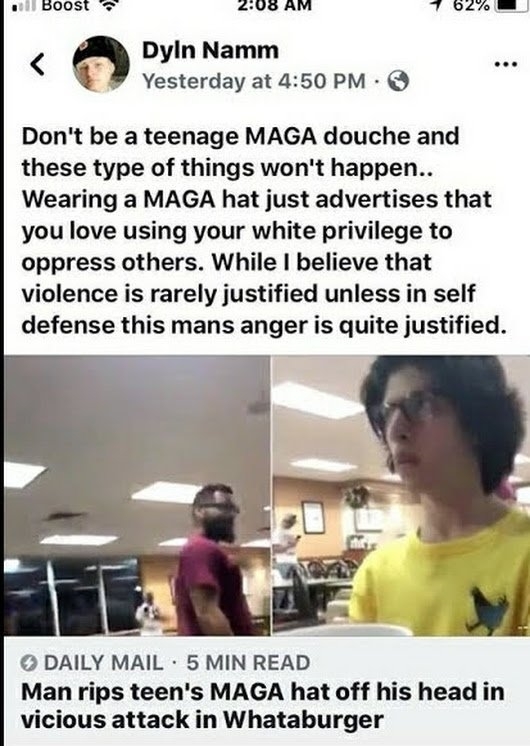 That means anybody wearing a Che Guevara t-shirt gets a thorough beat down. Anybody dressed as Antifa, get kneecapped. You parading with a Nazi armband, rotate the offending limb 90 degrees the wrong way at the elbow. Let’s up the ante, shall we? A Hillary or Bernie bumper sticker and the vehicle gets torched. Do you have lawn sign for some Left Wing candidate? Oh well. I seriously ask, Is the MAGA hat a hill you want to make your last stand on? The leadership of the Left will be complicit in any escalation if they do not disavow this type of behavior. If this goes on, someone is going to snap, and it won’t be pretty. Who knew that all this time, it has been acceptable to kick the crap out of people stepping on and burning the flag?